In addition to touring the Exhibit Hall and visiting the Planetarium, your group may also choose to sign up for an Enrichment Lab. These 45-minute, hands-on classroom programs will enhance your students’ experience with interactive lessons led by a Eugene Science Center educator, designed for up to 20 students at a time. Larger groups may be split into 2 or more sections and rotated among other field trip options (Exhibit Hall, Planetarium). $30 minimum cost for up to 15 students; $2 per additional student. Labs are subject to instructor and classroom availability and may not be available on all days. Choose your grade level to see which Enrichment Labs will work best for your students. Students examine toys that use center of gravity in surprising ways, leading to impossible-looking balancing acts and unexpected motion. Students will classify insects and other invertebrates into different families, then learn about specialized body parts and other adaptations that allow bugs to move, find food, and eat. Get a hands-on look at the vitamins, minerals, and energy contained in the foods we eat. Students will learn the importance of choosing the right foods in order to balance the calories we take in with the energy we exert. Join the electrons on a shocking journey! 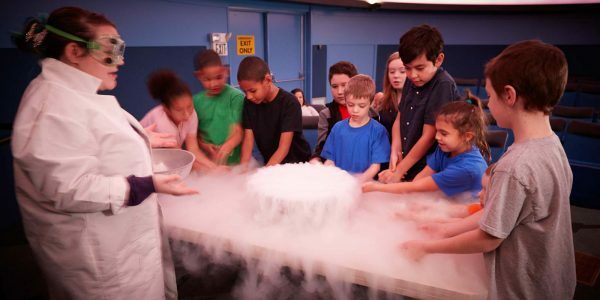 Explore static electricity versus current electricity using a Van de Graaff Generator, snap circuits, squishy circuits and more. Students learn what makes gyroscopes stay upright when spinning, how rotation affects forces in unexpected ways, and how gyroscopes are put to use in many toys and practical applications. Squid are the most highly developed and largest invertebrates on Earth. Explore invertebrate physiology of a squid during this 50 minute dissection lab. Dissection labs must be booked at least 1 month in advance. Please tell us what size and how many squid you would like to dissect based on number of students. We recommend 2-4 students per specimen. Jump into vertebrate physiology of a frog during this 1 hour dissection lab. Explore form and function of a frog’s external and internal anatomy, including the digestive, respiratory and reproductive systems. Dissection labs must be booked at least 1 month in advance. Please tell us what size and how many frogs you would like to dissect based on number of students. We recommend 2-4 students per specimen. Each enrichment lab is 45 minutes to 1 hour in duration and designed for groups of 20 students or less. Groups with more than 20 students can be split into two groups and registered for two back-to-back programs.